decades-long efforts put the Kuchipudi dance on the national pedestal as a classical dance form, with a long line of students like Reddy scattered all over the world today. Throughout the recital, the mother-daughter duo kept the audience captivated. The invocatory piece had all the characteristic rhythmic patterns & movements of Kuchipudi. Soumya portrayed the rigorous and joyous dance of Shiva as Nataraja in the Ananda Tandavam, taking hymns from Adi Shankara’s Shivananda Lahari, weaving the fluidity of dance form with the energetic, intricate dance movements, dramatically ending in frozen postures. rging with Paramatma. In the tarangam of Narayana Teertha, Soumya depicted Gopika vastrapaharanam, with Krishna teasing the bashful Gopikas. The concluding item was a tribute to Reddy’s Guru Vempati Chinna Satyam, highlighting his dedication to put the art form on a firm pedestal, his struggles along the way, and the accolades he received. This item brought fond remembrances of Guru Vempati to those who are associated with him in Pittsburgh. With synchronous and coordinated dance steps, the dance-duo highlighted their guru’s life. Explaining the spiritual inner meanings of each piece was useful for those unfamiliar with Indian performing arts, which is yet another approach for worshipping the Infinite, even as we recognize the entertainment value of these art forms. The invitation was for the Graduation Party of Ayan Rivu Sinha at the Fox Chapel Area High School on June 17, 2017. But it was not an ordinary graduation gala. Instead of a plain old-fashioned party, where the graduating child’s resume is mechanically recited, Ayan decided to entertain his well-wishers with a solo vocal concert. Those who knew Ayan, like most lovers of Hindustani classical music in Pittsburgh, were aware of this 17-year-old’s talent. His talents were on full display with considerable flair, seldom seen even among professional singers. Ayan started learning Hindustani music from his mother, Nidrita Mitra Sinha, when he was five. He continued to learn from Padmasri Pandita Tripti Mukherjee of Pandit Jasraj Instiute of Music (PJIM). On many occasions he was blessed with training and guidance from Sangeet Martand Pt. Jasraj-ji himself. Academically, graduating from Fox Chapel High School, Ayan is going to Case Western Reserve University, Cleveland, OH. Part 1 of the concert started, almost on time, with a Khayal in raga Puriya Kalyan—Vilambit Ektal Muraliya Baaji, followed by Dina Raina in Drut Teental, and ending in a chaturang tarana with Tana Dhi-re Na. Chaturang is a variety of tarana with 4 elements: tarana bol, pakhwaj bol, words and sargam. Ayan composed this tarana himself. Next was a Haveli Sangeet (a combination of kirtan and bhajan in worshipping Krishna), a semi classical piece—Laal Gopal Gulaal, in raga Margi Vasant in Deepchandi tal, popular in UP/Haryana/Rajasthan areas. After a break, Part 2 started with a Chhota Khayal Laj Rakho Banwari in raga Saraswati in Drut Ektal and ended with Tarana style in Drut Teental. Next, Ayan chose a Dhrupad piece, Jagadamba Jagadamba in raga Vasant in Chautal. It was somewhat daring for a young artist to attempt Dhrupad in which there is no taan and paltas; instead it has digun/trigun/chaugun, bol-taan and bol-baat. As the time moved on, the scene changed to soft, romantic and tender version of Khayal, Jiya Mein Laagi Aan Baan, a Dadra piece in raga Pilu followed by a Bengali semi-classical Jhanana Jhanana Baaje in raga Kalavati composed by Salil Chowdhuri in Drut Teental. Ayan finished his concert with a bhajan, Maayi Savare Ranga Raachi in raga Bhairavi, a straight, simple piece without much ornamentation of the notes. Ayan was accompanied on tabla by his father, Asish Sinha and on the harmonium by Neelesh Nadkarni, both providing commendable support for this young artist. On 21 April, the Antar Rashtriya Hindi Samiti (International Hindi Association, or IHA) organized a Kavi Sammelan (impromptu poetry recital) at the SV Temple auditorium. The evening was three continuous hours of humorous, satire-filled nonstop poetical repartee. The large attendance at the program was a testimony to the program’s success. The IHA, a nonprofit organization, strives to preserve and promote the linguistic tradition and interests related to Hindi on a global scale to highlight human values inherent in its literature. It is difficult to translate satire and humor in any language into other languages having different idioms, grammar, rhyming schemes and literary traditions. So, I can not bring out the nuances of the evening. The three poets who enlivened the evening were Gajendra Solanki, Sudeep Bhola and Sunil Jogi. Shri Gajendra Solanki started the evening with an ode to India, to its culture, to its temples, to Mahatma Gandhi, to Hindi the national language. In the ocean of languages, he claimed Hindi, the daughter of Sanskrit, was the nectar. Solanki in his melodious voice presented with satire the issue with demonetization, and needled politicians. With hilarious, elevating, clap-generating quips, he presented to the Desis living all over the world, declaring them Karma Yogis in the true sense. The young and talented Sudeep Bhola’s political satire and single liners were biting. With his charismatic poetic performance, he made the audience laugh and cry. He took us on a journey of emotions from satire and humor, to sacrifices by patriotic martyrs, to thought-provoking social issues on Indian women and children. Sia Iyer, a rising 7th grader, had her vocal Karnatic arangetram at Upper St Clair High School on July 8th, 2017. All of twelve years of age with a tiny presence on stage, but what a presence it was! She displayed her mastery over sruti, ragam, talam and kaala-pramanam and kept her audience spell-bound for a good two-and-a-half hours. Just as a diamond needs to be polished and chiseled to radiate its shine and luster, so too Sia is lucky to have her guru, Smt. Vijayalakshmy Subrahmaniam (Chennai), who worked tirelessly to bring out Sia’s best. Sia opened with the challenging Ata Tala Varnam in Todi and rendered it well. The majestic Vallabha in Begada followed with crisp sangatis and kalpana swarams executed with ease. A short raga alapana in Malayamarutam with lovely sancharas was followed by Dhanyudevvado, a Patnam Subramanya Iyer’s krti. Sia then took on Janani Ninnuvina, which she delivered with finesse. Sia then elaborated a detailed Kambhoji raagam (Evari Mata) with the hallmark sangatis of her guru. A short and sweet Ragam-Taanam-Pallavi in Ranjani followed, which Sia topped off with smooth and seamless transitions into Janaranjani, Sriranjani, and Shivaranjani. The Abhang, Sakha mazha moved many members in the audience to tears with Sia’s soulful rendition. Sia concluded the concert with a melodious but challenging tillana in Sindhu Bhairavi. Vidwan L. Ramakrishnan did an amazing job in executing silken strokes on the violin, while Vidwan Vinod Seetharaman excelled in mridangam accompaniment. Both gave the young Sia encouraging nods of approval. Samyukta Sreeram, a high-schooler, nicely complemented Vinod on the Ghatam. Pallavi Muluk was on the tambura. Sia, you’re a young talent with great potential. Remember, this is just a beginning in your journey in music. In the years ahead, you should strive for perfection. That will ensure you will be the best you can be. Shankar Krish has learned Karnatic music on the violin and is a familiar face among Indian classical music lovers in our area. I had the pleasure of attending the arangetram of Saarang Mulukutla on the violin in July 2017. With Sumesh Narayanan on mrdangam and Ravi Balasubramanian on ghatam, it was a melodious, engaging and enjoyable debut solo recital. As a student of well-known violinist L Ramakrishnan (who is a disciple of the veteran violinist A Kanyakumari), Saarang has absorbed the style of playing the instrument as well as rendering the compositions with equal emphasis on the lyrics and melody. Starting with the varnam, and through the many compositions, the tillana and mangalam, Saarang exhibited maturity and consistency on the violin. The highlight of the concert was his detailed alapana in raga bhairavi, a complex raga with unique phrases and characteristics. He rendered it quite well considering that this was his maiden concert. He brought out the highlights of bhairavi in the alapana and the composition ‘upachAramu jesEvAru’ to the best of his abilities. Sumesh and Ravi, the professional percussion duo, provided supportive rhythm accompaniments throughout the recital, encouraging Saarang all through. They played a fantastic tani avartanam (percussion solo) showcasing their expertise of their instruments. I had heard his guru Sri L. Ramakrishnan, a great teacher, just a week earlier. So, I could see that Saarang has absorbed the teachings and style of his guru. That Ramakrishnan taught Saarang mostly through online classes tells a lot of the dedication of both the teacher and the taught. Growing up in a family steeped in music, Saarang has clearly taken advantage of the environment at home and support from his family. With his hard work that I have personally observed, Saarang has blossomed into an excellent musician. Arangetram is only the first step, and I expect he will continue to improve on his skills, repertoire and the nuances of the Indian classical music tradition. “… If you look back to your first afternoon here at Cardigan, perhaps you will recall that you were lonely. Perhaps you will recall that you were a little scared, a little anxious. And now look at you. You are surrounded by friends that you call brothers, and you are confident in facing the next step in your education…. … And as far as the confidence goes… … it is not because you succeeded at everything you did, but because with the help of your friends, you were not afraid to fail. And if you did fail, you got up and tried again. And if you failed again, you got up and tried again. And if you failed again, it might be time to think about doing something else. But it was not just success, but not being afraid to fail that brought you to this point. “Now commencement speakers will typically also wish you good luck… I will not do that, and I’ll tell you why. From time to time in the years to come, I hope you will be treated unfairly, so that you will come to know the value of justice. I hope that you will suffer betrayal because that will teach you the importance of loyalty. Sorry to say, but I hope you will be lonely from time to time so that you don’t take friends for granted. “I wish you bad luck, again, from time to time so that you will be conscious of the role of chance in life and understand that your success is not completely deserved and that the failure of others is not completely deserved either. And when you lose, as you will from time to time, I hope every now and then, your opponent will gloat over your failure. It is a way for you to understand the importance of sportsmanship. I hope you’ll be ignored so you know the importance of listening to others, and I hope you will have just enough pain to learn compassion. “Whether I wish these things or not, they’re going to happen. And whether you benefit from them or not will depend upon your ability to see the message in your misfortunes. “Now some tips as you get ready to go to your new school. Over the last couple of years, I have gotten to know many of you young men pretty well, and I know you are good guys. But you are also privileged young men. And if you weren’t privileged when you came here, you are privileged now because you have been here. My advice is: Don’t act like it. Translation: “Even your Annan (older brother) and Tambi (younger brother) are as helpful [to grow] as the ‘beatings’ you gets [in life].” The “beatings” are the humiliations, failures, disappointments, and betrayals — even bad luck in life that the chief justice talked about in addressing his young audience. Well-educated Millennials (Desis included), many of them born to comfort bordering privilege, now are working trying to climb their career ladders. They too will benefit if they heed Justice Roberts’ speech. Given the recklessness emanating from the occupants of the West Wing offices of the White House today, I wonder whom the learned Chief Justice had in mind in his commencement address. Long-time residents of the Greater Pittsburgh Metro area know Mr. Som Sharma of Monroeville through at least one of the myriad endeavors (apart from his profession as a financial planner), of which Sharma is, or has been, the vital force and the prime mover. I was delighted to talk to him at the Green Mango Thai restaurant on Business 22. 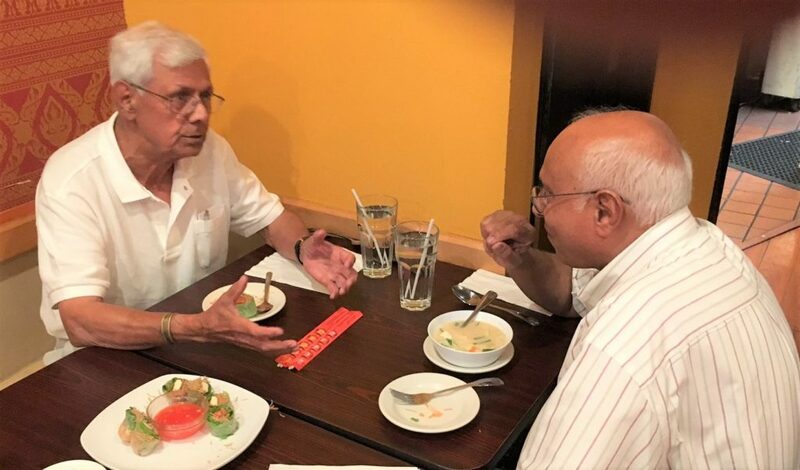 The primary intent was to learn more about Sharma’s association with the Monroeville Interfaith Ministerium, a group of representatives from different faiths, including Catholics, mainstream Protestants, Jews, Muslims, Sikhs, Buddhists, Jains, and Hindus. Interfaith dialogue is important in any society where people of many different faiths have to live and work together. In the US, in the early days, there were only the various denominations within Christianity to begin with. Jews arrived later. Many Americans until recently, were not even aware of other faiths such as Hindu, Moslem, Zoroastrian, Buddhist, Jain, Sikh, and Baha’I. 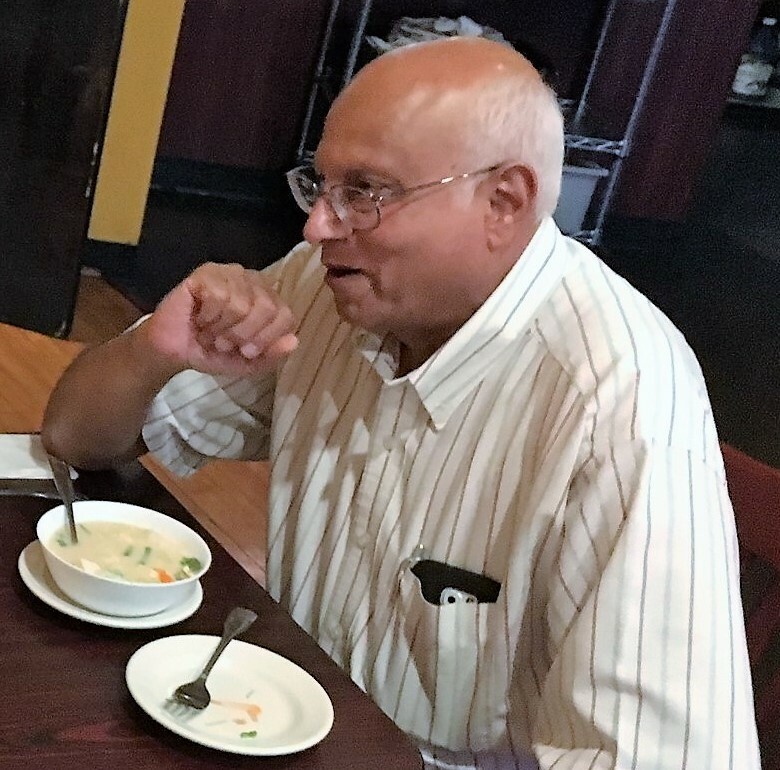 Som explained that in the early 1980s his wife Vandana volunteered as the director of the Indian community’s dance groups participating in the Pittsburgh Folk Festival and he helped in her organizational effort. This led to contacts with several ethnic communities in and around Pittsburgh and invitations from local churches to speak about the Hindu religion. This was one of the reasons why Som got involved in the interfaith dialogue, as a member of Monroeville Interfaith Ministerium. Ministerium is an association of clergy from various religious groups coming together to accomplish a specific purpose, often to build collegiality and address socioeconomic needs in the community. The clergy represented churches, synagogues, temples, mosques, and other congregations that are often connected geographically in a small town or group of small towns. Som said, “The 1893 Parliament of World Religions in Chicago is often regarded as the birth of the ‘Interfaith Movement.’ This congress was the first organized international gathering of religious leaders.” Swami Vivekananda spoke at this congress over 120 years ago. However, it seems to this writer that Indian communities all over the US are slow to see the merit of participating in local interfaith organizations. Som Sharma’s example was followed by Vinod Doshi (from the H-J Temple) representing the Jains, and Gurdayal Singh Mehta (Monroeville Gurudwara) representing the Sikhs. The seed sown by Som has grown into the Hindu-Jain Temple of Monroeville now becoming a member of the Monroeville Interfaith Ministerium, wherein Harilal Patel and Damayant Agarwal represent the Hindu-Jain Temple Pariwar. During Thanksgiving, the member organizations within the Ministerium take turns gathering at one of the participants’ place of worship to share a simple meal to bring people of all faiths together. After the ghastly 9/11 attack in 2001 on the World Trade Center in New York, interfaith dialogue became a necessity all across the US. Som has eloquently represented the Hindu faith at many of these gatherings, some of them held in open play grounds. Given the recent events in Charlottesville, NC (and earlier events of hate crimes committed against innocent Indians in Pittsburgh), one sees the need for the interfaith dialogue to keep going from strength to greater strength, for which Som sowed the seeds over three decades ago. 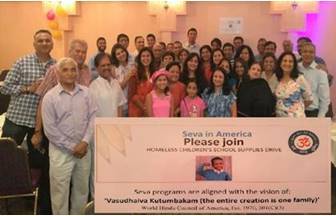 Volunteers from the Wold Hindu Council took the initiative for a noble cause. 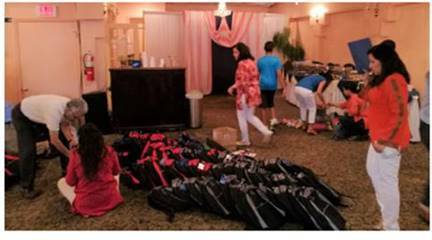 They pooled volunteers to organize filling school bags with supplies for students going to school in the Fall. These bags go to homeless school children in our area—by far the most needy and deserving students among us for this kind of assistance. The Monroeville India Garden Restau rant’s Shinghara Singh and his wife Davinder Singh offered their banquet hall for free to the volunteers for this group effort, and also fed the volunteers for free! On June 23rd Pittsburgh International Airport, after a thirteen year hiatus, got its first nonstop flight to Frankfurt with Condor Airlines’ twice-a-week flight. As Pittsburgh slowly shores up its international image, a nonstop flight to Frankfurt will greatly enhance this effort. The flight is seasonal, through September, and only twice a week — on Mondays and Fridays. Given how difficult it is to get nonstop flights to European destinations from second-tier cities in the US, this is a good start. 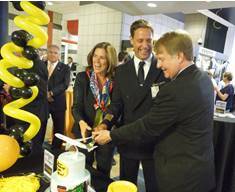 On the maiden flight were Rich Fitzgerald, the chief executive of Allegheny County, Christina Cassotis, CEO of Allegheny County Airport Authority, and other airport officials. 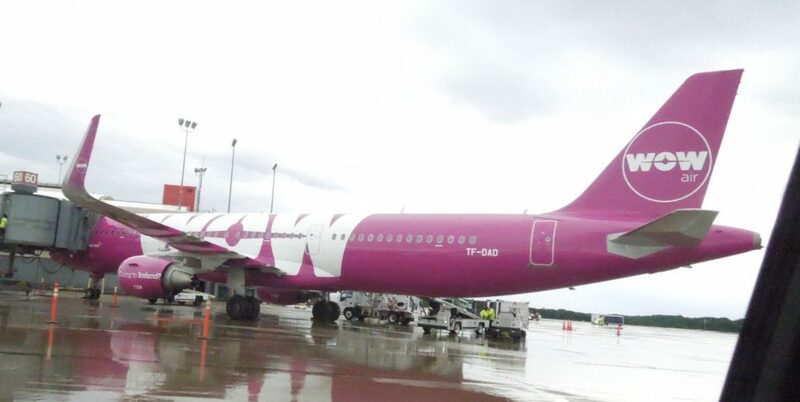 Earlier in mid-June, Iceland’s low-cost WOW Airlines started its all-year round, 4-times a week non-stop flights to Reykjavik from Pittsburgh. Coming on its heels, Condor’s twice-a-week seasonal flight will make travel to Europe convenient. On the day Condor’s maiden flight landed, we had a close-up view of the landing while standing on the taxiway close to the end of the runway. Water cannons welcomed the plane at the gate. See picture. A welcome ceremony was set up near the baggage claim area. Mr. Fitzgerald and other officials spoke. German favorites — pretzels, bratwurst and other snacks were laid out, and a celebratory cake was cut to the accompaniment of German music. “Additional service to Europe has been a top priority for Pittsburgh International Airport. The airline’s wide-body aircraft is a great addition for Europe-bound travelers from Pittsburgh,” said Cassotis in her remarks. Pittsburgh International valiantly tries to c orrect the reverses suffered by US Airways shutting down its PIT hub. Obviously, the new nonstops to overseas destinations are possible only with financial concessions to both Condor and WOW. Hopefully, with these steps, we will see better days. Even for the nonvegetarians among us, delicious all-vegetable dishes are a big part of our cuisine. Yet, how many of us know that we have an annual vegan food festival, VegFest, right here, in the ‘Burgh, every summer? 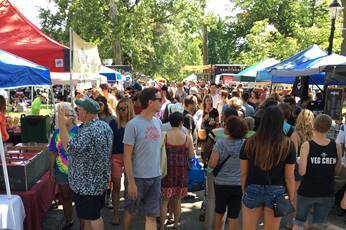 The third annual Veg Fest was held Saturday, August 6 at the Allegheny Commons Park East, close to Allegheny General Hospital. The balmy weather with a brisk wind attracted over 10,000 people — seniors, young parents with kids, and youngsters, lazing around the many stalls. Every cuisine was represented. In addition to Chinese, Thai, Mediterranean, and Indian food, people could taste vegetarian snacks from Mexico, the Caribbean, many parts of Europe — even grilles and chilies. When we went there around 2:00 PM (the closing time was 7:00 PM), many stalls had already run out of food — that is how popular the event was. In addition, there were stalls on cosmetics displaying items that had no animal content in them, and that did not use animals in testing. The prime movers behind VegFest are Leila Sleiman (right) and Natalie Fristick (left) in the picture on the right. They became friends while participating in a protest against animal cruelty in circuses. Their organization Justice for Animals (JFA), extends compassion to more than just dogs and cats. Leila has participated in other VegFest events across the US. Three years ago, they saw the potential for an outdoor VegFest in summer in Pittsburgh to highlight the issues in a family friendly and positive way. The sponsors for this year’s festival were: Whole Foods, Smoothy King, East End Food CoOp, WESA-FM 90.5 (Pittsburgh’s NPR news station), and Pittsburgh Port Authority, among others. People talk on globalization today as if it is something new. But this has been going on for over at least 2,500 years. 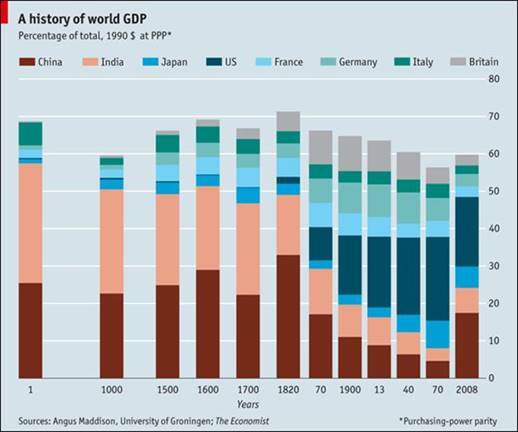 Before the Industrial Revolution (1760 to 1840 Common Era) triggered by the steam engine and spinning jenny in Europe, over 50% of the world GDP of those times was split between India and China for over 2,000 years. See the bar chart below (Source: The Economist). With so much of the world’s goods produced in these two Asian geographic regions, the bulk of the global trade of those times was between these two regions and Southern European empires and the region between them—mainly Arabia, Persia, the Persian Gulf, and Central Asia. Northern and Western Europeans — today’s Advanced Societies — were living either on trees or under tree shades, or in caves. 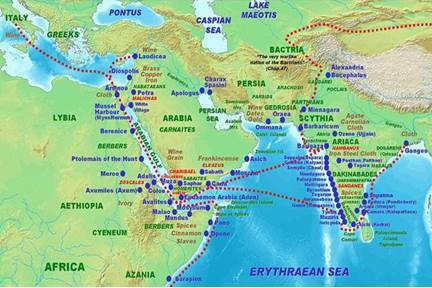 Many trade routes at the dawn of the Common Era are available on the Web. A typical one is shown further below. Global trade before the Industrial Revolution was peaceful, relatively speaking in any case, excepting for infrequent highway robberies and piracies along the routes affecting only the traders. However, global trade after the Industrial Revolution impacted the world in ways unimaginable before, leading to the complete destruction of native industries. The classic example is what Britain’s East India Company in India did to its sophisticated textile industries. Using foul means, the Company destroyed the sophisticated, traditional Indian textile industries in which thousands of families had been engaged for generations. Then it made the native population depend on textiles imported from England. The gory details are well documented. Merriam Webster: the process of globalizing; the state of being globalized; … the development of an … integrated global economy marked… by free trade, free flow of capital, and the tapping of cheaper foreign labor markets. Business Dictionary: The worldwide movement toward economic, financial, trade, and communications integration. SUNY Levin Institute: Globalization is a process of interaction and integration among the people, companies, and governments of different nations. It is driven by international trade and investment, aided by information technology. This process affects the environment, culture, political systems, economic development, prosperity; and Mankind’s well-being… around the world. The industrial powers of the world, mostly European, for nearly 250 years after the Industrial Revolution, mastered mass manufacturing and international trade backed by Science and Technology (S&T). Concurrent developments in S&T helped these great powers to strengthen their armies, navies and later, air forces. With governments, industry, S&T, military, and trade mutually helping each other, European empires, controlled the world economically, politically, and militarily. Japan was the only Asian power in this context. India, in its early days after independence, was in the Soviet Camp for decades. Decades before economists talked about integration of the world through trade, attempts were made to unite workers globally. In the 1960s, the common sloganeering among Indian Communists in rallies was, “Workers of the World, UNITE!” Indian Communists, inspired by their patron saints, the Soviet Union and China, were fighting for Indians to have working conditions similar to those in Europe. But the Indian communists then were wary of internationalizing capital, production and trade; for all their “modern” outlook, Indian communists were regressive and opposed modernization/computerization/automation. That is another story. Soviet Union is now dead and China is only nominally Communist. But Indian Communists, like rare marooned species in far away islands from their native habitat, still survive as endangered species living in their ideological past, which China and Russia, their spiritual masters, have abandoned decades ago. Now in India, an amalgam of Leftist Movements (communists, socialists and their fellow-travelers ensconced within the confines of the security the Indian Academia provides), is struggling to be socially and politically relevant. Discernible cracks are emerging within this amalgam. Capitalists are no better: While capitalists and governments professing Free Market economy want free flow of capital and goods across borders, they do not want a free flow of workers across borders. Also, globalization has been going on for long even in recent times, even though the term globalization was not attached to it. Indian IT professionals flooding the US during the Y2K crisis at the turn of the millennium is well known. It changed the demographics of the US — and Indians’ self confidence in themselves — in a fundamental way. The healthcare industry in the US and the UK is sustained only with the large number of healthcare workers—mostly doctors and nurses — from the Indian subcontinent, the Philippines, and Africa. Your fruits/vegetables are inexpensive because migrant farm workers from Mexico and Central America toil in harsh conditions that Americans do not want to work under. Also, for a long time, produce items from Mexico and Central America have been staple in American supermarkets. Western Europe’s farming is sustained only by cheap labor from Poland, Rumania, and other Eastern European countries. In culturally diverse countries, such as India and China, rapid and mass migrations within the individual nation-states is a new phenomenon. It has now become more rapid, and not confined to the better educated and trading classes. In India, the less-educated muscular youth seeking livelihood are moving from poorly managed states to more prosperous regions. This has added a new dimension to India’s social complexity. . The luster of the United Arab Emirates, Saudi Arabia, and others is built with their petro-dollars. But they had to import technology from the West; and cheap skilled workers from the Indian subcontinent working under precarious conditions that Arab natives refused to work under. The European trading companies, with help from their empires back home in France, England, Portugal, and Holland, ended up as colonizing/occupying powers, with Christian missionaries contributing to stir the pot. Read on the Goan Inquisition in India to know all the ghastly things unleashed by the missionaries in the Konkan region under the leadership of Francis Xavier (1502-1556), with help from Portugal’s king. Later, the Vatican canonized Xavier as a saint in 1622. In the early days of the British East India Company (in the 18th century), Anglo-French wars were fought on Indian soil. With no stakes in the war between England and France in Europe, Indian soldiers in the armies of Robert Clive and Joseph Dupleix spilled their blood and died in the Anglo-French wars fought on Indian soil. Read on the Carnatic Wars in India (between 1744-1763) for details. In the early 19th century, the British Empire had a huge trade deficit with China (China was a net exporter even then). To break this, England stealthily expanded its trade in China by exporting to China the opium made in India. This led to the Opium Wars (1839-60) that destroyed China’s ruling Qing dynasty, and made the Chinese populace opium addicts. The Chinese never forgot what the Europeans did to them. The world has changed. The unbridled advantages the industrialized West had for over 250 years with their superior grasp of S&T, industrial power, military strength, and wealth have run its course. S&T is now accessible to any society willing to invest in them and work at it. China has already emerged as a global economic power, in manufacturing, trade, and military. China has captured their glorious past with a vengeance. India is still emerging, but it may take another 30 years to regain its foothold. For this to happen the Indian middle class and its upper crust need to liberate themselves to look at India through their own lenses and not through the Europeans’ lenses. This is more easily said than done because the Indian upper crust today is completely uprooted from India’s languages and its literary, artistic and philosophical traditions. Even after seventy years since the British left India, Indian intellectuals and its middle class are in mental imprisonment of European reference points on India, craving for European recognition and acceptance in all walks of life. You are currently browsing the archives for the October 2017 category.